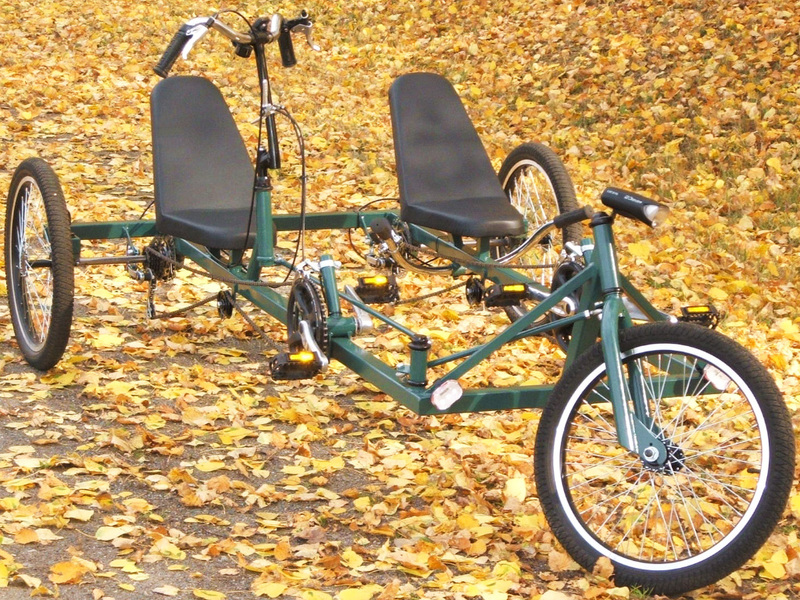 Build a Sociable Tandem Delta Trike. 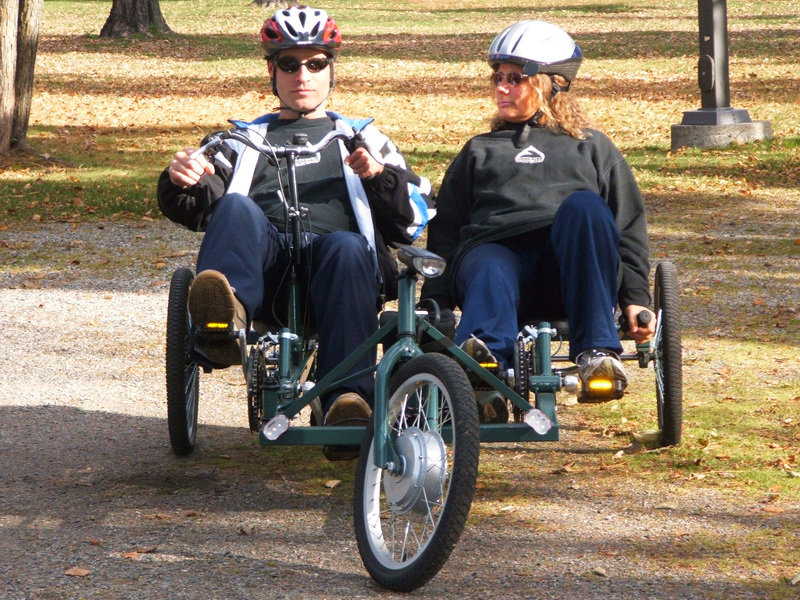 The term sociable trike refers to the fact that you can site side by side with your partner and enjoy a relaxing ride and chat. 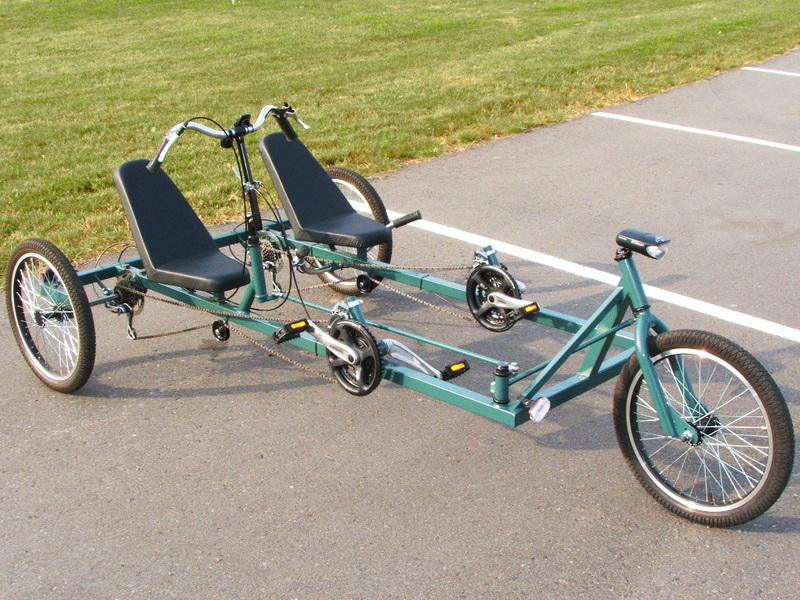 Conversation on an inline tandem is not as easy, but in this configuration, it is the same as an automobile, or living room couch. The Kyoto Cruiser is very comfortable and even offers fully independent transmissions for each rider. 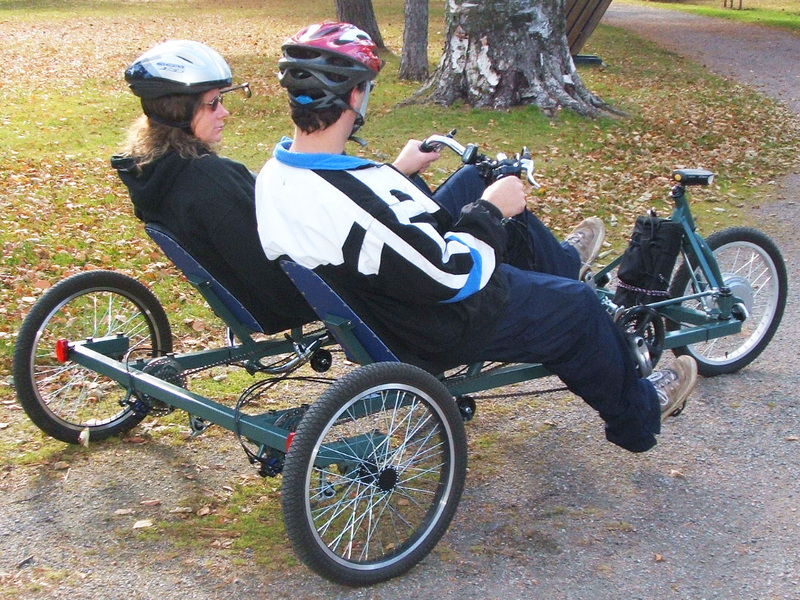 One person is in control of the steering nad brakes, so the trike can also be ridden by one person. This design is almost like having two recumbent bikes, each one having its own fully independent set of 25 to 36 speeds, just like a regular bicycle. Both riders can use any gear they like, and either one can stop pedalling at any time. Drive For Free in Your Human Powered Car! It costs nothing to drive your silent running human powered car. In fact, you can even save money by not needing that gym membership or weekly trips to the gas pumps. This DIY Tandem Trike handles extremely well at any speed, and can turn a circle in half the width of a city street. With all the room behind the seats, you can easily add a cargo box, or even a fully enclosed trunk to run errands like grocery shopping. The plans show you every single step of the build, and it can be done by anyone using only basic tools and bicycle components. There is only one simple machined part that can be made by someone or a shop on a basic lathe. Ride on The Street or Off The Road in Pure Comfort. 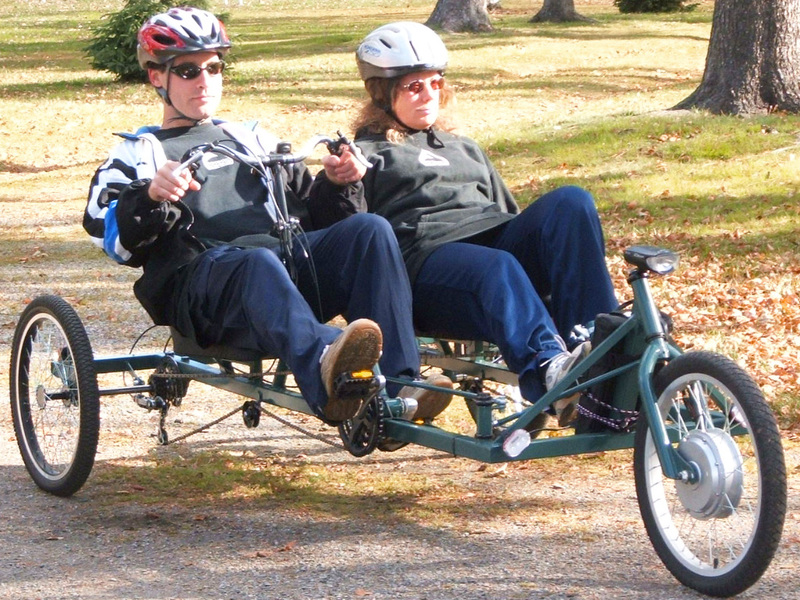 The comfortable recumbent tandem seating allows you and your partner to make that long commute or country drive with ease. You can add just about any type of seat you like, fomr the simple seats shown in the plans right to a full car seat with all the adjustments. 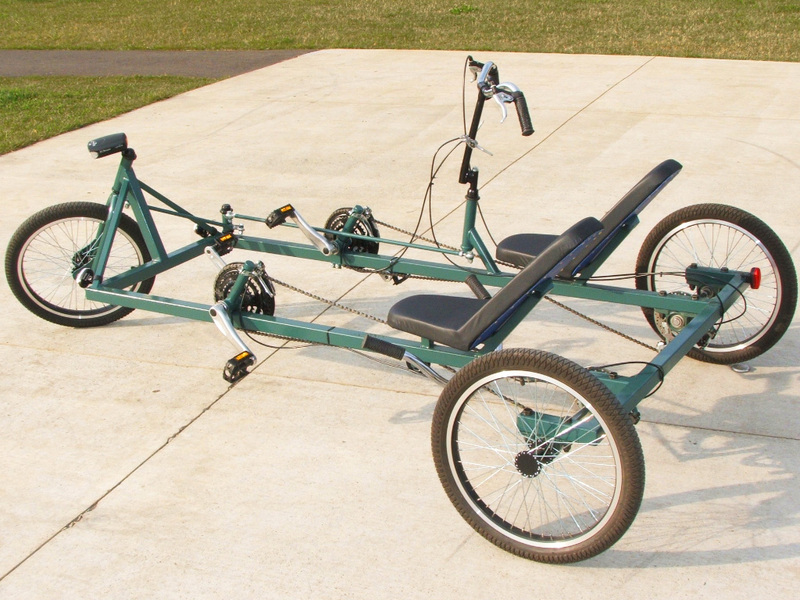 There is plenty of room for modification in this DIY Tandem Trike Plan, so you can create a human powered velocar that suits your style and requirments. The dual rear disc brakes offer plenty of stopping power, so you can safely navigate city traffic and enjoy hitting top speeds down that long hill. All of the brake components can be purchased at any bike shope, and they are not expensive. This Trike Makes a great Base For A full Body. With the rising cost of gas, and sedentary lifestyles we live, haing a human powered car just makes so much sense. 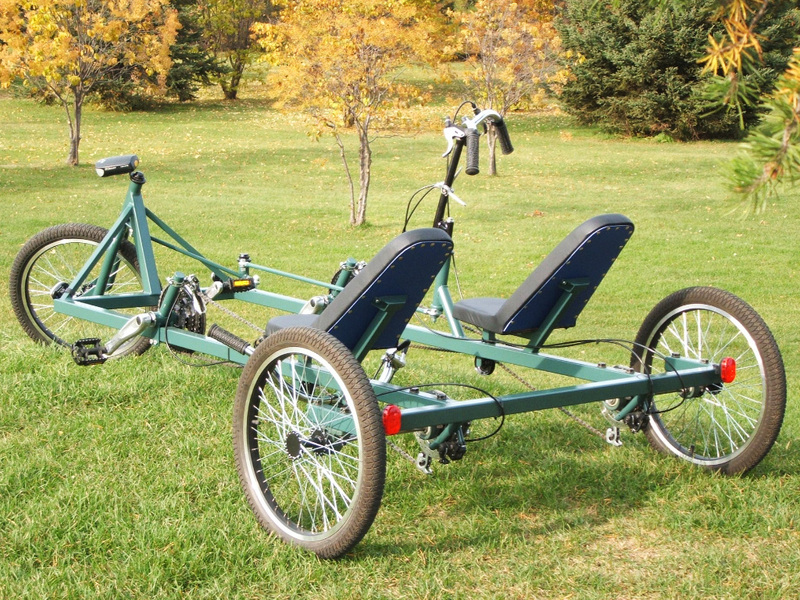 For those wanting to take the velocar concept further, this trike would make an excellent base for a full or partial body, allowing it to be used in all types of weather and all seasons. Like all of our DIY Plans, we promote experimentation and personal modifications, and this type of frame lends itself well for many modifications. To easily adapt to riders of any size and leg length, the cranks can be positioned any plance on the frame by simply adjusting the two bolts that allow the sliding bottom bracket to be moved. This adjustability will support any size or age of rider on either side. Efficient Human Power That Also Looks Great. Even with a single rider, the trike runs very well, but with the teamwork of two riders on a single vehicle, efficiency is doubled. The hill climbing ability of this trike is amazing since you can just gear down, relax and spin away until you have conquered any slope. Off road riding is fun and comfortable on this trike, and it has been designed to take whatever terrain you feel like riding on, even rough gravel roads and trails. The steering system can be built using basic hardware store components and steel tubing, and it allows for a full range of turning, while at the same time keeping all moving parts out of the way of leg traffic. The steering system can also be built on either side of the trike. Add an Electric Motor and Forget Your Car. That cylinder on the front wheel is called a bicycle hub motor, and it can drive your trike up to city speeds on silent electric power. Hub motor kits come in all sizes and power outputs, so you can get a little boost up that hill, or completely motorize your trike, making into a true car alternative. This DIY Trike offers many places to install a large battery bank, so you could add enough electric range for many hours of silent running power assist. The square steel frame tubing is easy to cut and weld, and out DIY Trike Plans show you every single cut in great detail, so that anyone can build their own tandem trike. Used bicycle components can also be used to save money, and we prmotoe recycleing. Over Seat Steering and Standard Bike Levers. You sit comfortably just like you do in your car, and you control everything just like you do on a standard bicycle. All levers and shifters are placed on the pilot's handlebars for easy access, and the stoker has their own independent gear shifting levers as well. You can install the pilos steering system on either side of the trike during the buildm, or even offer both riders control over the steering if you like. Even the rear wheels are built using nothing but washers and some steel rod. That's right, there are no hubs or machined parts on the rear wheels, and they can be easily made by anyone using just a hand drill and angle grinder. The plan is highly detailed. Build Your Own DIY Human Powered Vehicle. This plan offers a real alternative to the fuel hungry SUV, and can be ridden for fun and to do errands like grocery shopping. You can add a cargo box or even a trailer and do some serious cargo moving with your human powered team, or with the addition of an electric assist motor. The Kyoto Cruiser DIY Sociable Tandem Trike is an easy to build velocar that can really improve your life, and you can take pride in saying you built it yourself. If you have been looking for a way to leave the car parked more often, then this DIY Trike is the perfect solution. 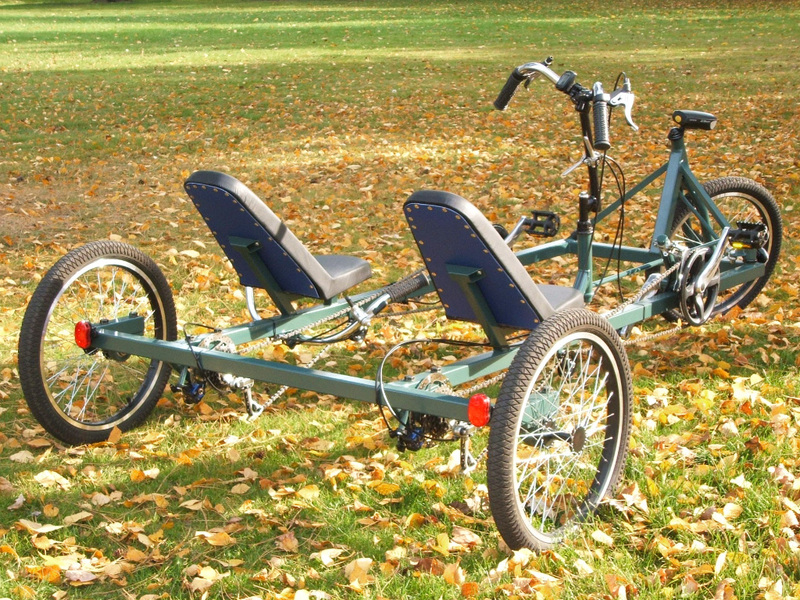 Build your own sociable tandem trike for the cost of a few tanks of gas. You will enjoy building this trike as much as riding it.